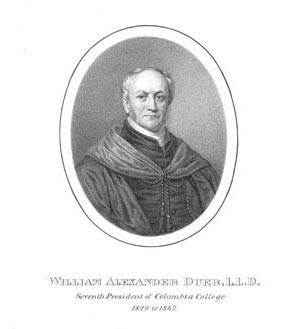 A lawyer and jurist of note in New York State, William A. Duer had held many offices, both judicial and political, previous to accepting the presidency of Columbia College. His administration was marked by continuing financial stress which was augmented by the founding of New York University as the University of the City of New York in 1832. To offset the anticipated competition, a literary and scientific course was set up, in addition to the arts course, which merited a certificate upon completion. The curriculum was expanded in other ways and many special lectures were instituted in an effort to attract students. Duer's wise and efficient administration won the admiring affection of his college associates, and his eloquence in speaking and debate gave him a leading place in the community. Owing to ill health, Duer retired to Morristown, NJ in 1842 where he recovered sufficiently to devote himself to literary pursuits publishing articles on his recollections of New York.